When Soldiers, Sailors, Airmen, and Marines leave the military service they are generally young, fit, and eager to get to work in the civilian world. Many go to school to obtain an education, but many more jump headlong into the job market. Unfortunately, they are not as prepared as they could be to compete in the cutthroat employment marketplace. It is not because the government is not trying to help transitioning military folks learn the skills they need to get a job, because there are a multitude of programs out there to help with transition. Unfortunately, those programs are not nearly as effective as they could and should be. The Department of Defense, the Veterans Administration, and Department of Labor have spent many millions of dollars (over $50 Million in 2012 alone) on various programs designed to help veterans make the transition from military service to the civilian world. These agencies are charged with conducting classes, seminars, and counseling that is designed to help those who are hanging up their uniforms with the challenging and often confusing process of becoming a civilian again. Despite the efforts of these agencies, there is a serious problem with unemployment for recently discharged veterans. The population of younger veterans who are recently discharged is having the toughest time, with those in the 20 – 24 year old age bracket hitting an unemployment rate of 35% in March of this year according to a Syracuse University study that was released last month (available here: March 2013 Employment Situation of Veterans) . That stunning number is well over double the rate for the same population of non-veterans. That means that a lot of our veterans are out of work, and as a result the DOD is paying a lot of money out in the form of unemployment benefits to those who can’t find a job. It is a shocking amount of money. I mean really shocking! How shocking? Try nearly $1 Billion dollars a year (the actual number was $928 million for 2012 and is on track to increase in 2013). Almost one billion dollars. For unemployment benefits. For veterans who cannot find a job. And it comes out of the DOD’s annual budget, and every dollar that is spent on unemployment benefits for a veteran is a dollar that is not spent on the people still serving or the equipment that they use to keep our nation safe. Paying unemployment insurance for separated military personnel is not new for the Department of Defense. In fact, the DOD has been paying millions of dollars in unemployment benefits for a long time, but the billion dollar pricetag is unprecedented. In 2003, the military paid about $300 million on such benefits, and a decade later that cost has over tripled. There are a lot of reasons for the increase, with the most obvious being the increase in the number of people leaving the military and having a rough time finding a job in the tough economic conditions that exist today. That is only part of the story, however. The Obama administration, to their credit, has increased funding and awareness for the plight of jobless veterans. Unfortunately, those efforts are not paying the dividends that they should be. With such a high level of emphasis and funding for transition training and education, you would think that the unemployment rate for veterans would be at or below the non-veteran level. Unfortunately, it is not. That is where the data from the Orders to Nowhere Military Transition Survey becomes very interesting. As I continue to research the subject of military transition, I have been analyzing the data from the survey and a few data points really jump out. The first data point is how little feedback about the transition process is actually gathered by the organizations that are actually doing the transition training. Every branch of the military uses After Action Reviews (AARs) to gather feedback from events and learn from the lessons that the AAR provides. Pilots debrief every mission in order to become better aviators and infantrymen get together and discuss the lessons that they learned from their combat or training engagements. These debriefs and lessons learned sharing sessions are part of every service and every career field. Capturing lessons and learning from experience is a crucial part of what makes our military unbeatable. Unfortunately, the AAR process does not seem to apply to transitioning or recently transitioned veterans. Despite the culture of learning from experience, the vast pool of potential data sources — recently transitioned veterans — is virtually untapped. The data shows that, of respondents who left the service between 2003 and 2013, less than one in five had been contacted by the Department of Defense or their branch of service about transition. Of those one in five who had been contacted, less than half (0r just under 10% of all respondents) were asked to participate in an AAR of the transition process. In other words, fewer than one in ten recently discharged veterans have been asked to help make the transition process better by providing feedback on their experience. That, to me, is an incredibly disappointing statistic. It is not particularly surprising, however. Nobody officially asked me anything about my transition, and in my many conversations with veterans I have found that nobody asked them either. Millions and millions of dollars are being spent every year on the military transition process, yet unemployment rates for veterans continues to exceed their civilian counterparts. Nearly a billion dollars is being spent by the DOD on unemployment benefits for those unemployed veterans. You would think that somebody would connect the dots between the efficacy of the military transition programs and their effect on the unemployment rate, but sadly the most readily available resource of feedback is largely being ignored. Nobody is asking the vast majority of people who have gone through those transition programs and entered the civilian workforce about their experiences and how the transition programs could be improved. The answers are out there. Too bad nobody is asking the right people the questions. 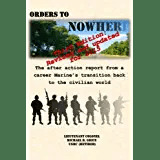 In yet another shameless plug- I can never get enough data in the Orders to Nowhere Military Transition Survey. So if you have transitioned from the US military (it doesn’t matter when), please take the survey! If you have take it, I thank you. Please ask others to take it too! This entry was posted in Military Transition, Officer, Retirement, Transition Posts, Transition, Marine Corps, Active Duty, Retirement, Retired, Retiring, TAP, TAMP, Ruehlin, military, career, EAS, Enlisted, Officer, Commission and tagged 25+ Retirement Seminar, active duty, career, EAS, Enlisted, Marine Corps, military, Military Transition, Officer, Retirement, Ruehlin, TAMP, TAP, transition, VA, Veteran, Veterans Administration. Bookmark the permalink. What do you miss about being in uniform? I am trying to help a young man who is currently homeless and lives around my work. He was in the Army, was deployed twice, is only 22. He is leary of the VA and any help they can give him. He is suffering from PTSD. He is lost and I feel he was failed in his transition to civilian life. I have offered to take him to the VA when I go, or to help him with forms as needed. Any other suggestions other than the VA? I can’t make him do anything, but he needs the help. It is so wrong for any Vet to be living on the street. Thanks for your information and sharing your process! I think that one of the best approaches is to bring him to a Veterans Service Organization such as the Disabled American Veterans, the Veterans of Foreign Wars or the American Legion. They are great organizations with great people who would be very eager to help. They can also demystify the VA processes and get him the help he needs. Thanks for what you are doing! I speculate that after a long absence from the academic environment, despite the fact that these veterans spent countless hours learning complex skills, many experience some self-doubt about their ability to succeed in a college or university. Of course that is generally an erroneous assumption. As Thomas Edison is credited with stating, “Genius is one percent inspiration and ninety-nine percent perspiration.” Warriors do know how to perspire. 3) a career path that he or she will pursue passionately? How can we convince them that if they apply the same work ethic that they applied in the military, that they should be able to succeed in any endeavor for which they have some interest and aptitude? In my own example, I had been a chemistry major for two years, a “B” student, but then saw a high school buddy who had been shot in the leg in the “Hill Fights” in Vietnam. So I joined for three years before returning to college. I did audit a chemistry and a calculus course upon my return as refreshers for those subjects, but otherwise I was nearly a straight “A” student for my B.S. and M.S., and I worked part time as an undergrad and full time as a graduate student. I’m not a genius, but I do know how to perspire. Either the Corps or just maturing or both factors transformed me from an average to a good student. A charismatic geology professor during my first semester back inspired me to change my major, and now for over forty years I have been paid to have fun. I believe that the overwhelming majority of these young veterans could also succeed if they use their G.I. Bill benefits and return to college. So what factors prevent them from doing this? I am too out of touch to know, but my wish is that all of them would be as fortunate as I have been in finding a meaningful and enjoyable career. Those are great observations – thanks! I think that your comment about pursuing a career instead of just looking for a job is particularly important. If we can figure that out, the battle will be half won. I will be attending the Youth In Government: Conference on National Affairs and my legislation that I will be proposing is a reform to Transition Assistance Programs across the United States. I just have a few questions for you, because you seem well versed in matters such as these. 2) Even if the government reforms the transition programs are there enough jobs to provide for veterans? 3) Is it possible for specialists to be assigned to Veterans in order to change their military skills into those that are oriented toward civilian jobs or do they do that already? Any help you can give me would be gladly appreciated. I am currently a junior in high school and I have a great respect to those men and women who serve. Thank you for all you do. 2) I am not an expert on the availability of jobs, but the disparity of the civilian/veteran employment rates indicated that there are employment opportunities available but being filled disproportionally by non-veterans. 3) The VA does have many programs, but in my experience many veterans are either unaware of them or not located near enough to VA facilities that provide such services. Thank you so much for responding! I will definitely cite these websites in my speech. If it’s alright with you, can I quote you? Sure- feel free to quote me as a source. I am a Grad Student at Central Connecticut State University and am a Navy Vet. I am interested in conducting some research on the various approaches the different branches take on their individual TAPS programs. I want to look at how each branch executes their program and compare to see if there is equal distribution. Do you happen to have any guidance on how to gather information that would allow for proper analyzation? Sure- I will shoot you an email. Thanks for reading!